Are you looking for a way to specifically document your collected evidence for TPGES? Then look no further! 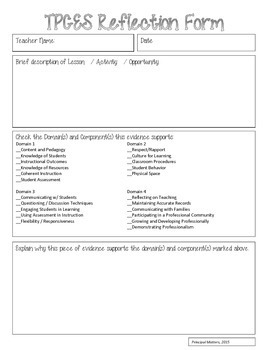 Use this professional form to briefly describe the artifact or evidence, mark which Domain and Component from the Framework for Teaching supports the collected evidence, and provide an explanation as to why you believe the evidence supports the domain and component. This product includes a PDF file as well as an EDITABLE file for your convenience. Please visit Principal Matters for other TPGES resources as well as classroom resources! Thanks for taking a look at my product!